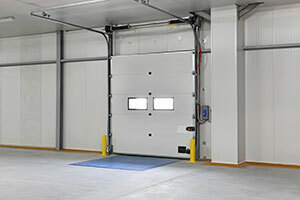 Especially in new home construction, the garage door may have been given little thought, other than to provide an element of security for the homeowners’ belongings. 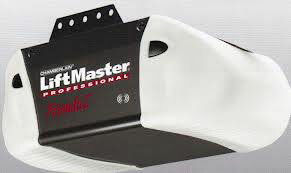 Most of the builder-supplied doors do not have handles, if an electric garage door opener is provided. Homeowners have taken it upon themselves to add interesting hardware to the doors. This hardware is not only functional, but decorative as well. Wrought iron handles and decorative hinges embellish an otherwise plain door. Other options include contemporary-style handles or other architectural elements. These more contemporary accessories are manufactured of brushed stainless steel or nickel, high-gloss aluminum, or deeply colored plastic or vinyl. Most of the owner-provided hardware reflects the taste and style of the owner. Paint options may include a particularly outstanding and distinctive color, or a mural or picture painted on the surface. Sometimes, particularly in contemporary installations, a trompe l’oeil is painted that can fool the eye into seeing a landscape or a landmark. There are many color options available today, including custom colors that can accurately match a color of the homeowners’ choosing. Vibrantly painted garage door surfaces can take the door from average to accent in a few short hours with a gallon of paint. 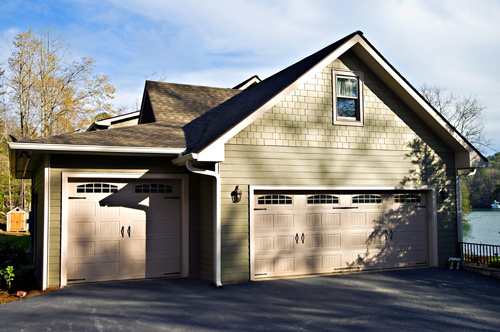 In homes of a distinctive architectural style, the garage door can maintain the style. Rather than presenting a blank panel door, the wood doors can resemble barn doors, rough timber or a rustic look, or Tudor-style architecture, among others. Whatever decorative option you choose to dress up your garage door, it’s usually a good idea to make sure it matches or blends with your existing architectural style. After renovating the door, be prepared to accept glowing compliments.